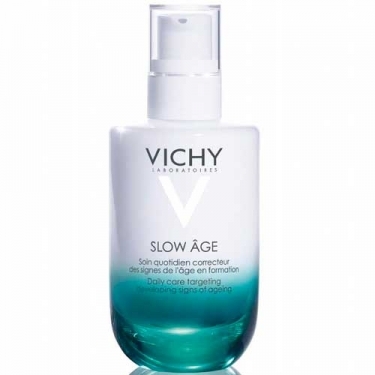 DESCRIPTION: Slow Âge Soin Quotidien Correcteur from Vichy is a daily anti-wrinkle care that corrects the signs of aging in training. The first care of Vichy that works to reduce the appearance of aging signs, thanks to a combination of ingredients inspired by nature. Vichy laboratories associated an antioxidant extract from Baicalina roots, traditionally used in China, to fortifying Bifidus and Vichy Mineralizing Water. This concealer consists of a greasy, melting and fresh fluid. It gives 24 hours of hydration and SPF 25. Day after day, the skin proves to be vibrant with luminosity. Sensitive Skin, Hypoallergenic *, No Parabens. * Tested to minimize risks and allergy.